Harvard Park at Tucker Hill is the retail development now open near the entrances of our new home community. This three-story building takes up almost 40,000 square feet. Most noteworthy, Harvard Park fulfills the Traditional Neighborhood Development concept. This urban design concept encourages residents to choose walking or bike-riding to visit merchants. 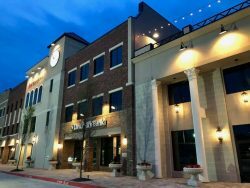 As the primary anchor, Keller Williams McKinney now occupies about 18,500 square feet of second and third floor space. The building’s owner, The Nash Group Commercial Real Estate, offices on the second floor. Landmark Bank also opened on the first floor, center section, and runs a 24-hour virtual drive thru on the west-side of the building. Furthermore, another first floor tenant now includes Pratt/Aycock Attorneys (also known as Texas Title) and a Farmers Insurance Agency office. All of these tenants can enjoy two dining choices. Petra Fresh Mexican Bistro is now open on the east side space of building’s first floor. They are serving breakfast, lunch and dinner, Mondays-Saturdays. They also have an outdoor patio dining area. The second restaurant, Palio’s Pizza, is also open on the west-side space of the building’s first floor. They have intimate fireplace seating with TVs, as well as outdoor patio dining. Palio’s has several other locations throughout DFW. They will be open for lunch and dinner seven days a week. Built by Dallas-based Crown Sterling Properties, this company purchased the site for Harvard Park from Tucker Hill’s developer, Southern Land Company. Finished in early 2018, the The NASH Group now owns this beautiful building. The architectural plans for this building look and feel much like something you would find in a historic town square. Much thought has gone into a design that reflects the same architectural standards found in Tucker Hill. The building features a shaded, roof-top meeting space for Keller Williams (private rentals may be available). In addition, all will enjoy beautifully landscaped areas, including a charming gazebo. For more information, please contact Chayse Harvard at 214-793-8800.